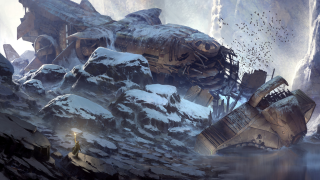 The next game from Endless Legend creators Amplitude Studios has been announced. It's Endless Space 2, a sequel to the space-based 4X strategy. Below, you can watch the first trailer—a CGI affair that should successfully put you in the mood for some galactic colonisation. Endless Legend fans will note that the trailer's ship is the same one from that game's recent free update. It added a victory condition that, as Tom Senior put it, "lets you build a spaceship and flee the planet in a culture-wide mic-drop exit that will make your enemies sad." Here's the ship in-game, and here's some lovely concept art. It suggests that the new game will more directly tie into Endless Legend. Head over to the official Endless Space 2 site to attempt to glean any additional information. It's slim pickings right now, but we'll learn more next week at Gamescom.